Most of us know at least a little bit about dinosaurs, whether we learned it in school or from the blockbuster Jurassic Park. We might know the difference between a T-Rex and a Velociraptor but how much do we really know? These elusive creatures have left scientists and researchers stumped for decades, from how big they actually were to what really killed them in the end these are the top ten unanswered dinosaur mysteries! 10. Which one really was the biggest? The jury is still out on whether or not poor old Mr T-Rex was actually the king of the dinosaurs. Sure, he is certainly the most well-known but probably not the largest. Some fossils indict that certain dinosaurs would have reached up to 120 feet in length, the Supersaurus and Argentinosaurus are both in the running for the title of the longest and largest dinosaur of them all with the Supersaurus being 5 storeys tall, and people today are scared of tiny spiders? This one still remains a mystery mainly because scientists haven’t found that many fossilised Nyasasaurus’. This particular species of Labrador sized dinosaur is said to have evolved around 245 million years ago which makes it just a tad bit older than its other dinosaur relatives. That doesn’t necessarily mean it was the very first dinosaur, just the oldest one that scientists have managed to find – so far. 8. What the heck actually killed them? Contrary to popular belief, scientists aren’t actually 100% sure what annihilated the entire dinosaur population. While most of us have been taught that the big bang (no, not the TV show) was what wiped them out, some are certain that they were dying out before the asteroid ever hit. Maybe it was climate change or changes in their ecology but somehow avian dinosaurs (see the image) managed to hang out a lot longer than their land roaming counterparts. Why? Who knows! That’s why it’s still a mystery. 7. How did they get down and dirty? We know that like modern day reptiles that dinosaurs hatched from eggs, but how they got there is still a bit of a mystery. Did Mommy and Daddy dinosaur have a close relationship and raise their young together or did they simply do the deed and leave? While some fossils that have been discovered indict that they did in indeed spend at least a bit of time as a family unit. Dinosaur dating was complicated. 6. Were there any fluffy or cute dinosaurs? Most people generally think of horns, scales and teeth when they envision a prehistoric dinosaur but believe it or not some of the avian dinosaurs were actually considered “fluffy”. The Mircoraptor and Anchiornis had feather like coverings and closely resemble a small modern day bird with long tails and colourful feathers. While you probably still wouldn’t want to cuddle up to them and give them a good pat, they were pretty adorable. 5. Dinosaurs were colourful, or maybe not? If you grew up watching Jurassic Park and The Land Before Time (Oh that last one was just me?) then you probably thought that dinosaurs came in all different colours. However, scientist’s today have back tracked on their original theory that they were colourful to attract mates and instead come to a sort of conclusion that dinosaurs were probably more along the colour scheme of elephants and hippos. It is also important to add that this isn’t 100% confirmed and that some scientist’s strongly believe that avian dinosaurs were all sorts of wonderful shades. 4. Were they pack creatures? This one is still being heavily debated and probably won’t ever be completely solved unless someone invents a time machine to take us make to the Triassic period. Many people assume that dinosaurs hunted in packs because of what they saw in Jurassic Park, however there isn’t any solid evidence that this is true. There have been some findings of a few Diplodocus being fossilized together but that might have just come down to timing, sure it would be nice to think that they all hung out together in packs like wolves but we can’t be sure. 3. Giant cold blooded lizards or hot blooded creatures? 2. Night owls or early bird? This has got to be one of the most unsolvable dinosaur mysteries out there. 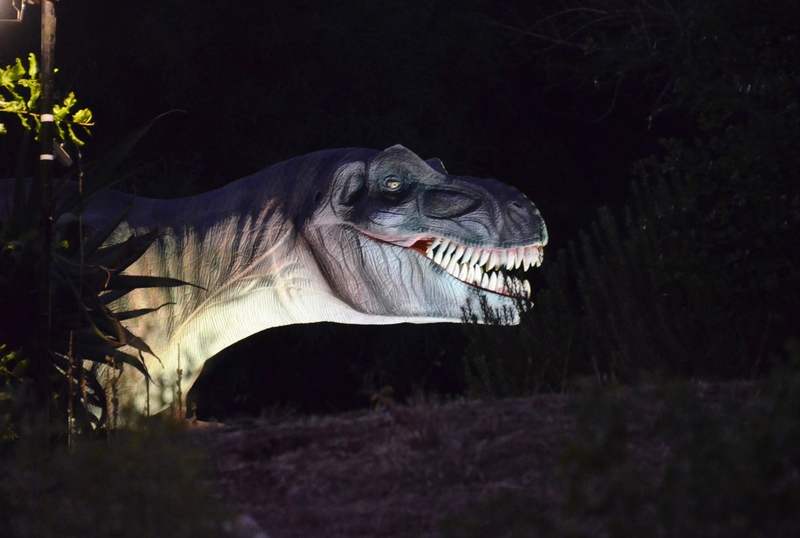 Were dinosaur’s nocturnal like lions or did they hunt during the day? Most of the research on this topic is comparing them to modern day animals and hunters, depicting them as creatures that would have relaxed during the day and been more active at night. There has also been the discovery of the sclera ring in the eye socket which points to most dinosaurs having expert night vision, so if they could see in the dark why wouldn’t they hunt under the cover of darkness? 1. What’s with the accessories? Most dinosaurs when they come to mind have some type of elaborate head gear or fancy spike. At first glance you might think that the Triceratops has large horns and flaps to attack potential predators but scientists argue that most of the dinosaur’s coverings were simply ornamental. Basically, that it was used as a sort of identifier for other dinosaurs of the same species, like you wouldn’t know when you saw another T –Rex? Either way the reasoning behind dinosaur’s outer appearance is still up for debate.